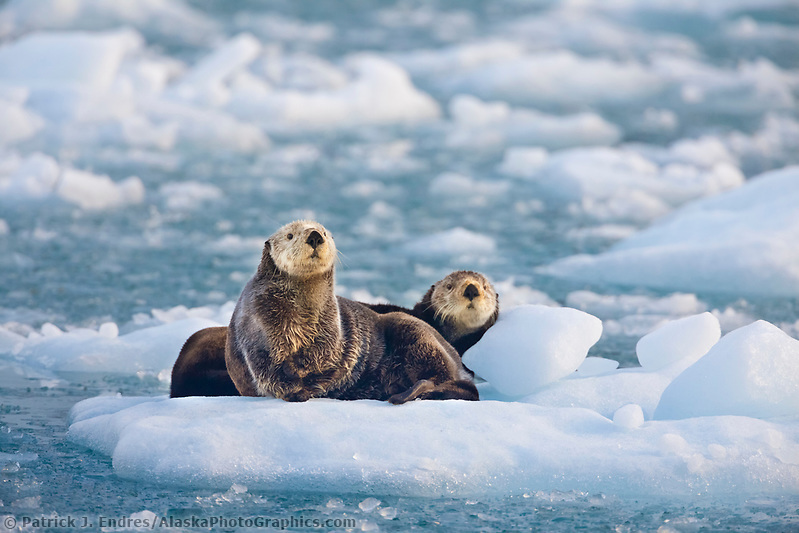 Sea otter photos and natural history information about Alaska's sea otters. 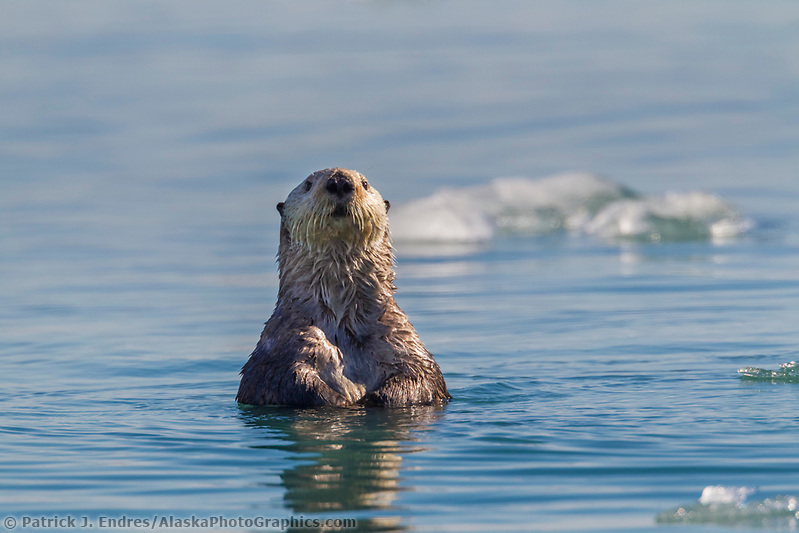 The sea otter lives in shallow water areas along the shores of the North Pacific. Its range once extended from southern California north then west through the Aleutian Islands, to the Kamchatka Peninsula, and south to the northern islands of Japan. 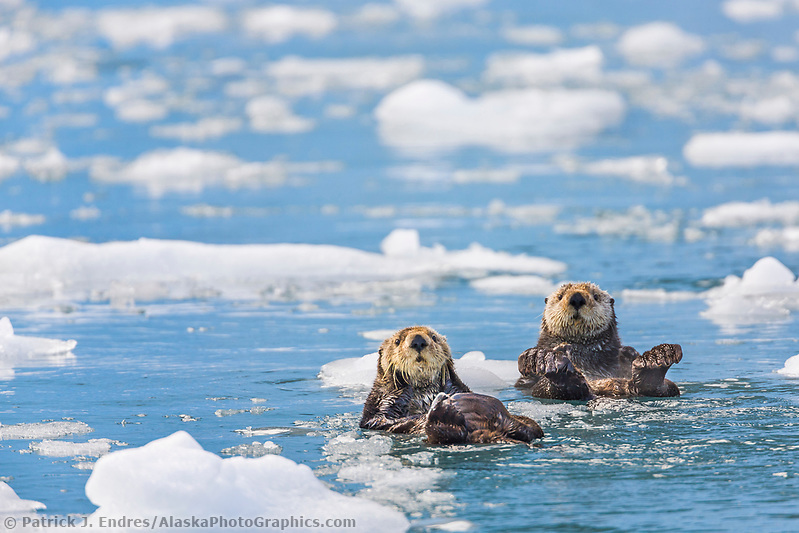 The sea otter photos shown here were taken primarily in the Prince William Sound region. 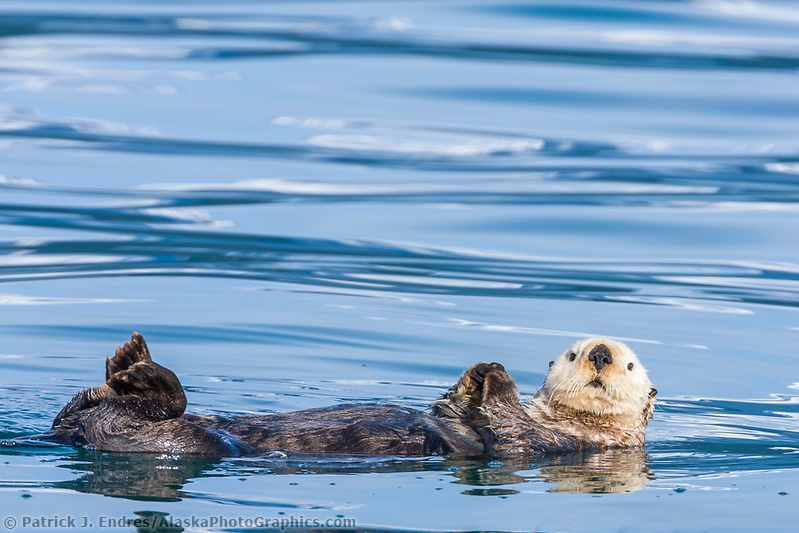 All sea otter photos on this site are available for purchase as commercial stock photography or fine art display pictures for home or office. Sea otters are members of the weasel family (Mustelidae) and are related to mink and river otters. Adult males weigh 70 to 90 pounds (32-41 kg) and females average 40 to 60 pounds (18-27 kg). Adults reach a length of 4.5 feet (1.4 m). The fur consists of a very dense underfur of inch-long fibers and sparse guard hairs. The underfur ranges from brown to almost black. 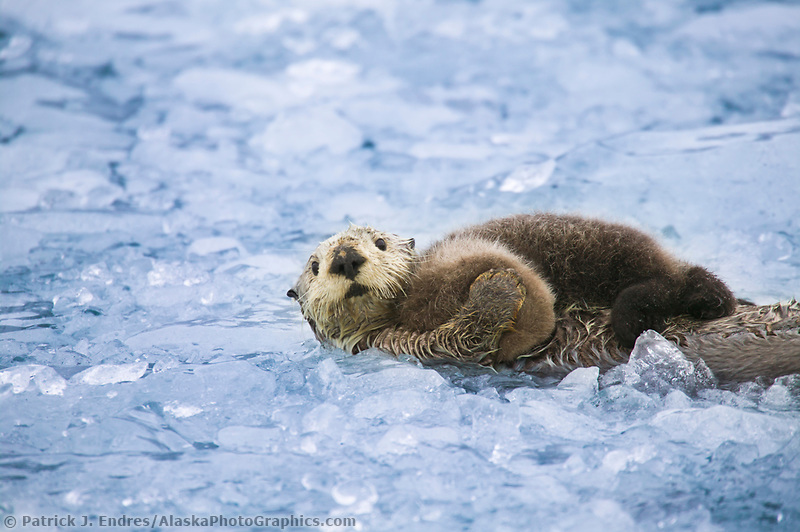 Sea otters depend on air trapped in their fur for maintaining body temperature. If the fur becomes soiled or matted by a material such as oil, the insulation qualities are lost. For this reason, otters spend much time grooming their fur to keep it clean. 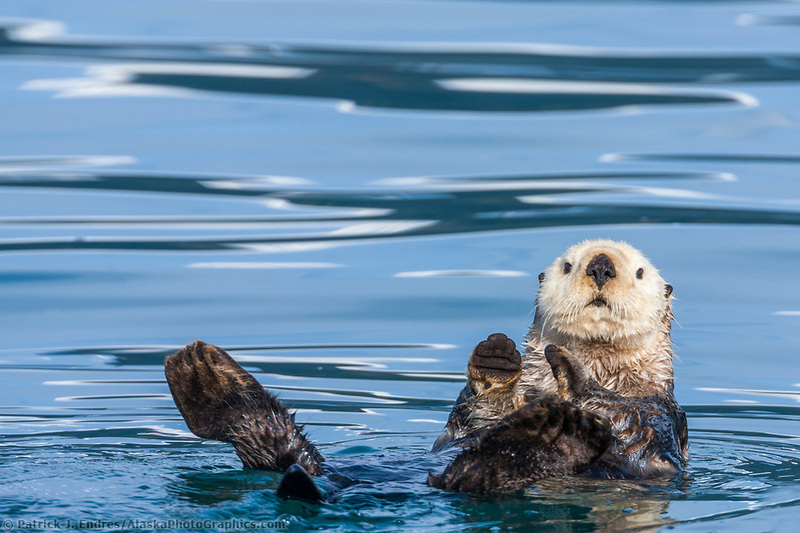 Sea otters mate at all times of the year, and young may be born in any season. However, in Alaska, most pups are born in late spring. The pup may weigh 30 pounds (14 kg) when weaned and looks almost as big as its mother. Females can produce one pup a year, but in areas where food is limited, they may produce pups every other year. They seldom travel far unless an area has become overpopulated and the food is scarce. Bald eagles prey on newborn pups and killer whales may take a few adults, but predation is probably insignificant. 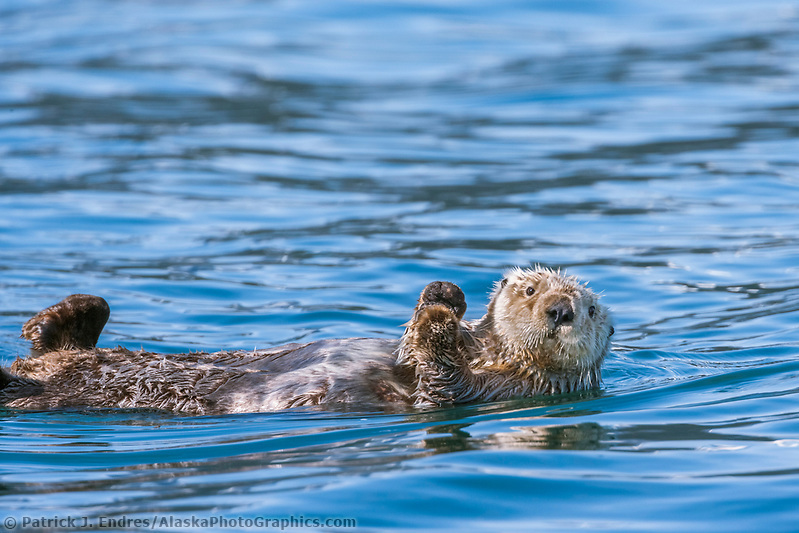 Many sea otters live for 15 to 20 years. Sea urchins, crabs, clams, mussels, octopus, other marine invertebrates, and fishes make up the normal diet of sea otters. They usually dive to the bottom in 5 to 250 feet of water and return with several pieces of food, roll on their backs, place the food on their chests and eat it piece by piece using their forepaws and sometimes a rock to crack shells. Feeding dives generally last less than one minute although some otters are capable of staying underwater for five minutes or more. 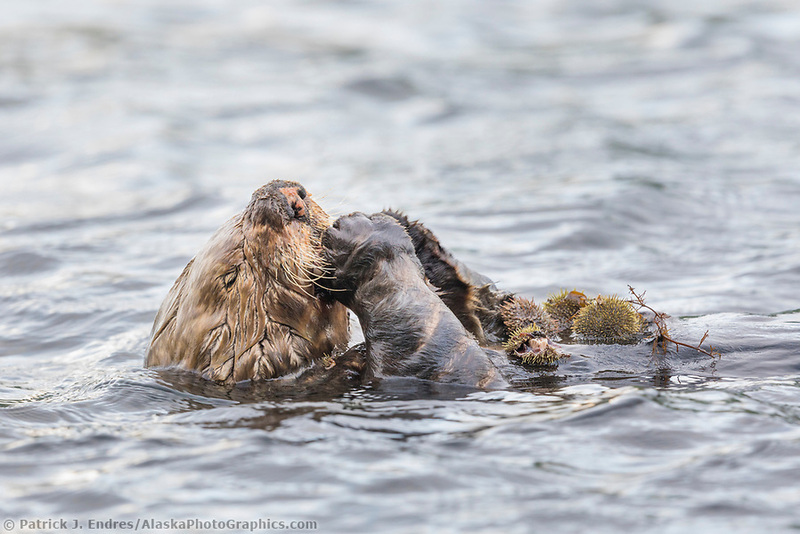 Their feeling habits may result in conflicts with subsistence, recreational, and commercial fishers when otters move into areas that support important shellfish resources.